This article is about the mythological monster. For other uses, see Minotaur (disambiguation). In Greek mythology, the Minotaur (/ˈmaɪnətɔːr/, /ˈmɪnəˌtɔːr/; Ancient Greek: Μῑνώταυρος [miːnɔ̌ːtau̯ros], Latin: Minotaurus, Etruscan: Θevrumineś) is a mythical creature portrayed in Classical times with the head and tail of a bull and the body of a man or, as described by Roman poet Ovid, a being "part man and part bull". He dwelt at the center of the Labyrinth, which was an elaborate maze-like construction designed by the architect Daedalus and his son Icarus, on the command of King Minos of Crete. The Minotaur was eventually killed by the Athenian hero Theseus. 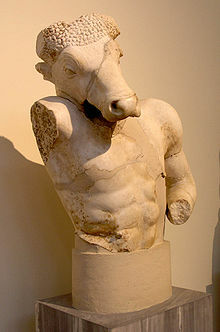 The term Minotaur derives from the Ancient Greek Μῑνώταυρος, a compound of the name Μίνως (Minos) and the noun ταύρος "bull", translated as "(the) Bull of Minos". In Crete, the Minotaur was known by the name Asterion, a name shared with Minos' foster-father. 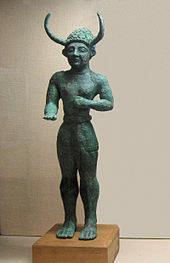 After he ascended the throne of the island of Crete, Minos competed with his brothers to rule. Minos prayed to Poseidon, the sea god, to send him a snow-white bull, as a sign of support (the Cretan Bull). He was to kill the bull to show honor to the deity, but decided to keep it instead because of its beauty. He thought Poseidon would not care if he kept the white bull and sacrificed one of his own. To punish Minos, Poseidon made Pasiphaë, Minos's wife, fall deeply in love with the bull. Pasiphaë had craftsman Daedalus make a hollow wooden cow, and climbed inside it in order to mate with the white bull. The offspring was the monstrous Minotaur. Pasiphaë nursed him, but he grew and became ferocious, being the unnatural offspring of a woman and a beast; he had no natural source of nourishment and thus devoured humans for sustenance. Minos, after getting advice from the oracle at Delphi, had Daedalus construct a gigantic labyrinth to hold the Minotaur. Its location was near Minos' palace in Knossos. The Minotaur is commonly represented in Classical art with the body of a man and the head and tail of a bull. One of the figurations assumed by the river spirit Achelous in seducing Deianira is as a man with the head of a bull, according to Sophocles' Trachiniai. Androgeus, son of Minos, had been killed by the Athenians, who were jealous of the victories he had won at the Panathenaic festival. Others say he was killed at Marathon by the Cretan Bull, his mother's former taurine lover, which Aegeus, king of Athens, had commanded him to slay. The common tradition is that Minos waged war to avenge the death of his son and won. Catullus, in his account of the Minotaur's birth, refers to another version in which Athens was "compelled by the cruel plague to pay penalties for the killing of Androgeos." Aegeus had to avert the plague caused by his crime by sending "young men at the same time as the best of unwed girls as a feast" to the Minotaur. Minos required that seven Athenian youths and seven maidens, drawn by lots, be sent every seventh or ninth year (some accounts say every year) to be devoured by the Minotaur. When the third sacrifice approached, Theseus volunteered to slay the monster. He promised his father, Aegeus, that he would put up a white sail on his journey back home if he was successful, but would have the crew put up black sails if he was killed. In Crete, Minos' daughter Ariadne fell madly in love with Theseus and helped him navigate the labyrinth. In most accounts she gave him a ball of thread, allowing him to retrace his path. Theseus killed the Minotaur with the sword of Aegeus and led the other Athenians back out of the labyrinth. On the way home, Theseus abandoned Ariadne on the island of Naxos and continued. He neglected, however, to put up the white sail. King Aegeus, from his lookout on Cape Sounion, saw the black-sailed ship approach and, presuming his son dead, committed suicide by throwing himself into the sea that is since named after him. This act secured the throne for Theseus. This essentially Athenian view of the Minotaur as the antagonist of Theseus reflects the literary sources, which are biased in favour of Athenian perspectives. 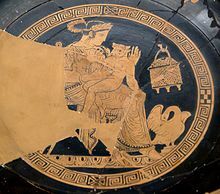 The Etruscans, who paired Ariadne with Dionysus, never with Theseus, offered an alternative Etruscan view of the Minotaur, never seen in Greek arts: on an Etruscan red-figure wine-cup of the early-to-mid fourth century Pasiphaë tenderly cradles an infant Minotaur on her knee. While the ruins of Minos' palace at Knossos were discovered, the labyrinth never was. The enormous number of rooms, staircases and corridors in the palace has led some archaeologists to suggest that the palace itself was the source of the labyrinth myth, an idea generally discredited today. Homer, describing the shield of Achilles, remarked that Daedalus had constructed a ceremonial dancing ground for Ariadne, but does not associate this with the term labyrinth. According to A. B. Cook, Minos and Minotaur are only different forms of the same personage, representing the sun-god of the Cretans, who depicted the sun as a bull. He and J. G. Frazer both explain Pasiphaë's union with the bull as a sacred ceremony, at which the queen of Knossos was wedded to a bull-formed god, just as the wife of the Tyrant in Athens was wedded to Dionysus. E. Pottier, who does not dispute the historical personality of Minos, in view of the story of Phalaris, considers it probable that in Crete (where a bull cult may have existed by the side of that of the labrys) victims were tortured by being shut up in the belly of a red-hot brazen bull. The story of Talos, the Cretan man of brass, who heated himself red-hot and clasped strangers in his embrace as soon as they landed on the island, is probably of similar origin. A historical explanation of the myth refers to the time when Crete was the main political and cultural potency in the Aegean Sea. As the fledgling Athens (and probably other continental Greek cities) was under tribute to Crete, it can be assumed that such tribute included young men and women for sacrifice. This ceremony was performed by a priest disguised with a bull head or mask, thus explaining the imagery of the Minotaur. The Minotaur (infamia di Creti, Italian for "infamy of Crete"), appears briefly in Dante's Inferno, in Canto 12 (l. 12–13, 16–21), where Dante and his guide Virgil find themselves picking their way among boulders dislodged on the slope and preparing to enter into the seventh circle of hell. 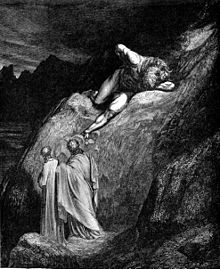 Dante and Virgil encounter the beast first among the "men of blood": those damned for their violent natures. Some commentators believe that Dante, in a reversal of classical tradition, bestowed the beast with a man's head upon a bull's body, though this representation had already appeared in the Middle Ages. ma vassi per veder la vostre pene." who in the world put you to death. he comes to view your punishments." In these lines Virgil taunts the Minotaur in order to distract him, and reminds the Minotaur that he was killed by Theseus the Duke of Athens with the help of the monster's half-sister Ariadne. The Minotaur is the first infernal guardian whom Virgil and Dante encounter within the walls of Dis. 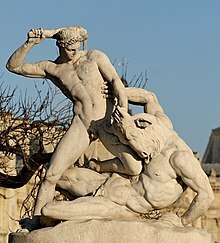 The Minotaur seems to represent the entire zone of Violence, much as Geryon represents Fraud in Canto XVI, and serves a similar role as gatekeeper for the entire seventh Circle. 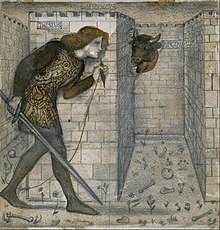 Giovanni Boccaccio writes of the Minotaur in his literary commentary of the Commedia: "When he had grown up and become a most ferocious animal, and of incredible strength, they tell that Minos had him shut up in a prison called the labyrinth, and that he had sent to him there all those whom he wanted to die a cruel death". Dante Gabriel Rossetti, in his own commentary, compares the Minotaur with all three sins of violence within the seventh circle: "The Minotaur, who is situated at the rim of the tripartite circle, fed, according to the poem was biting himself (violence against oneself) and was conceived in the 'false cow' (violence against nature, daughter of God)." Virgil and Dante then pass quickly by to the centaurs (Nessus, Chiron, Pholus, and Nessus) who guard the Flegetonte ("river of blood"), to continue through the seventh Circle. From 1933 to 1939, Albert Skira published an avant-garde literary magazine Minotaure, with covers featuring a Minotaur theme. The first issue had cover art by Pablo Picasso. Later covers included work by Salvador Dali, Rene Magritte, Max Ernst, and Diego Rivera. 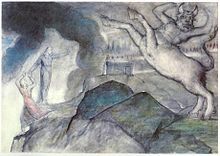 Pablo Picasso made a series of etchings in the Vollard Suite showing the Minotaur being tormented, possibly inspired also by Spanish bullfighting. He also depicted a Minotaur in his 1933 etching Minotaur Kneeling over Sleeping Girl and in his 1935 etching Minotauromachy. The Minotaur appears as the protagonist of Steven Sherill's The Minotaur Takes a Cigarette Break. The character returns in The Minotaur Takes His Own Sweet Time. The documentary Room 237 suggests that the film The Shining (1980) is a re-telling of the myth of the Minotaur. A minotaur, descended from the original mythological figure, appears in the third episode of the 2014 television series The Librarians ("And The Horns of a Dilemma"). Golden Axe Foods, an agribusiness firm founded by survivors of the Minoan civilization (the name refers to a symbol of the Minoan monarchy) have imprisoned the minotaur to recreate the Labyrinth in order to maintain their wealth and prosperity. The minotaur is presented as a large, bull-headed man in leather garb, who can shapeshift into the form of a muscular biker. It is freed when the labyrinth is destroyed, and proceeds to exact revenge upon its captors. The novel House of Leaves references The Minotaur in House of Leaves. The titular kaiju of Pulgasari has the appearance of a minotaur, and is based on the metal-eating folk monster Bulgasari. The Minotaur, an opera by Harrison Birtwistle. Minotaurs are common enemies in the God of War series. Titan (board game) – includes the Minotaur as a game character. The Minotaur is a prominent "boss" enemy in the Labyrinth in the "Spartan: Total Warrior" video game. The first and sixth bosses in Shadow of the Colossus are stone minotaurs. The similarly-built fifteenth boss is known as "Minotaur C" in the codes, despite the lack of horns. The storyline of the 2017 virtual reality video game Theseus revolves around the titular hero's mission to defeat the Minotaur. In Assassin's Creed: Odyssey (2018), there is a mission where the main character (Alexios or Kassandra) visits the ruins of the Knossos Palace in order to kill the Minotaur in the Labyrinth of the Lost Souls. Minotaur was a playable hero in Mobile Legends: Bang Bang. ^ "English Dictionary: Definition of Minotaur". Collins. Retrieved 20 July 2013. ^ "American English Dictionary: Definition of Minotaur". Collins. Retrieved 20 July 2013. ^ Kern, Hermann (2000). Through the Labyrinth. Munich, London, New York: Prestel. p. 34. ISBN 3791321447. ^ semibovemque virum semivirumque bovem, according to Ovid, Ars Amatoria 2.24, one of the three lines that his friends would have deleted from his work, and one of the three that he, selecting independently, would preserve at all cost, in the apocryphal anecdote told by Albinovanus Pedo. (noted by J. S. Rusten, "Ovid, Empedocles and the Minotaur" The American Journal of Philology 103.3 (Autumn 1982, pp. 332-333) p. 332. ^ In a counter-intuitive cultural development going back at least to Cretan coins of the 4th century BC, many visual patterns representing the Labyrinth do not have dead ends like a maze; instead, a single path winds to the center. See Kern, Through the Labyrinth, Prestel, 2000, Chapter 1, and Doob, The Idea of the Labyrinth, Cornell University Press, 1990, Chapter 2. ^ The Hesiodic Catalogue of Women fr. 140, says of Zeus' establishment of Europa in Crete: "...he made her live with Asterion the king of the Cretans. There she conceived and bore three sons, Minos, Sarpedon and Rhadamanthys." Chisholm, Hugh, ed. (1911). "Minotaur" . Encyclopædia Britannica (11th ed.). Cambridge University Press. ^ Several examples are shown in Kern, Through the Labyrinth, Prestel, 2000. ^ Examples include illustrations 204, 237, 238, and 371 in Kern. op. cit. ^ Servius on Aeneid, 6. 14: singulis quibusque annis "every one year". The annual period is given by J. E. Zimmerman, Dictionary of Classical Mythology, Harper & Row, 1964, article "Androgeus"; and H. J. Rose, A Handbook of Greek Mythology, Dutton, 1959, p. 265. Zimmerman cites Virgil, Apollodorus, and Pausanias. The nine-year period appears in Plutarch and Ovid. ^ The wine cup is illustrated in Larissa Bonfante and Judith Swaddling, Etruscan Mythology (Series The Legendary Past, British Museum / University of Texas at Austin) 2006, fig.29 p. 44 ("early fourth century") (on-line illustration). ^ Sir Arthur Evans, the first of many archaeologists who have worked at Knossos, is often given credit for this idea, but he did not believe it; see David McCullough, The Unending Mystery, Pantheon, 2004, p. 34-36. Modern scholarship generally discounts the idea; see Kern, Through the Labyrinth, Prestel, 2000, p. 42-43, and Doob, The Idea of the Labyrinth, Cornell University Press, p. 1990, p. 25. ^ The Encyclopaedia Britannica: A Dictionary of Arts, Sciences, Literature and General Information. Encyclopaedia Britannica Company. 1911. ^ Paolo Alessandro Maffei, Gemmae Antiche, 1709, Pt. IV, pl. 31; Hermann Kern, Through the Labyrinth, Prestel, 2000, fig. 371, p. 202): Maffei "erroneously deemed the piece to be from Classical antiquity". ^ The traverse of this circle is a long one, filling Cantos 12 to 17. ^ Kern, Hermann (2000). Through the Labyrinth. Munich, London, New York: Prestel. p. 116–117. ISBN 3791321447. ^ The fallen angels, the Erinyes [Furies], and the unseen Medusa were located on the city's defensive ramparts in Canto IX. ^ Bennett, Pre-Raphaelite Circle, 177-180. ^ "Dante Family letters Rossetti Archive". Rossettiarchive.org. ^ O'Grady, Megan (12 December 2002). "Dreaming of Hoofbeats". The New York Times. ^ Gurganus, Allan (2 October 2016). "A Minotaur's in Maintenance in a Tale of Rust Belt America". The New York Times. ^ "Madness and the Minotaur (1982)". Dragon Data. 1982. p. 3. Retrieved 4 November 2018. ^ "Theseus on the PlayStation Store". Retrieved 11 November 2018. ^ Billcliffe, James (1 November 2018). "Assassin's Creed Odyssey A Place of Twists and Turns Quest Guide – How to find and defeat the Minotaur to get the artifact". vg247. Gamer Network. Retrieved 4 November 2018.